For more than two decades, visitors to the Mauritshuis in The Hague have watched experts conserve and restore paintings by masters such as Johannes Vermeer and The Goldfinch painter Carel Fabritius. From 14 June, the public will again have the opportunity to see conservators in action, when two specialists embark on a project to clean the oldest work in the Dutch museum’s collection: The Lamentation of Christ (around 1460-64) by Rogier van der Weyden and his studio. The treatment, due to be completed by the end of the year, will take place in a special studio in the institution’s exhibition galleries. The oil-on-panel altarpiece is being treated for aesthetic reasons, says the museum’s senior conservator Carol Pottasch. She hopes to restore the picture’s original colours by removing layers of yellowed varnish that has caused the pinks to turn orange and the sky to become more green than blue. As well as stripping off old varnish, Pottasch and fellow conservator Lieve d’Hont will remove old retouches that have darkened over time. They also hope that research will reveal more details about how this painting fits into his oeuvre. The artist did not sign his paintings. 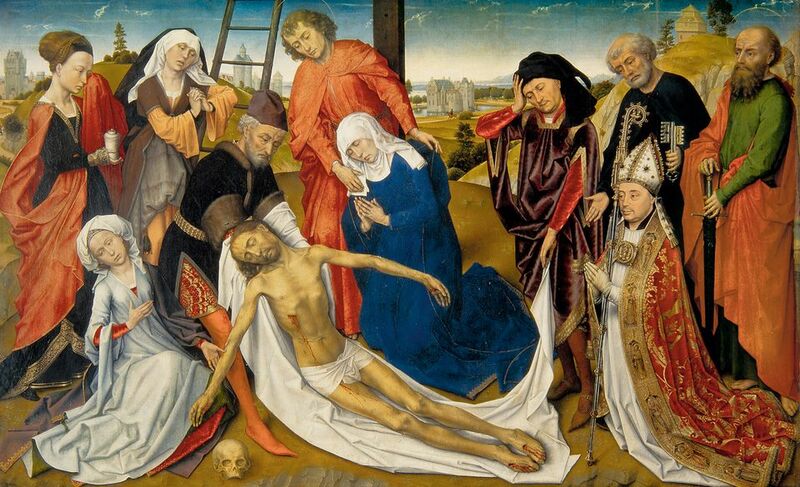 Through historical documents, scholars have been able to attribute just three works to Van der Weyden, with a larger group being labelled as Van der Weyden and his studio, including The Lamentation of Christ. “We’d like to be able to determine how much of it is by Van der Weyden’s own hand,” Pottasch says. It was standard practice for Van der Weyden to work collaboratively with his studio and The Lamentation’s attribution is expected to remain the same after the cleaning, says the curator Ariane van Suchtelen. She is organising a focused exhibition to coincide with the cleaning that addresses issues such as attribution, the painting’s commission, studio practices and iconography. The Mauritshuis has also secured a major loan, from the Uffizi in Florence, of an altarpiece of a similar date by Van der Weyden and his studio, The Entombment of Christ (around 1460-64), so visitors can compare the two works.